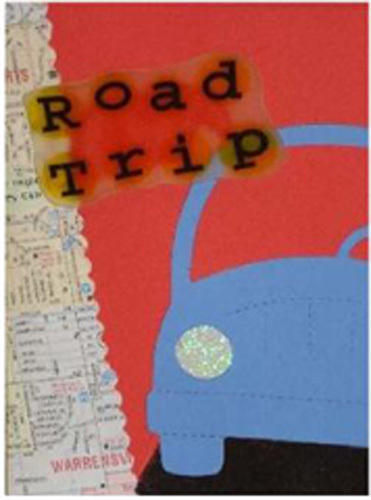 Project Description: Make your own cards with Grafix products, like this Road Trip card. Print “Road Trip” with a yellow background on to the Shrink Film. Cut out and back according to the instructions on the package. Die Cut, or trace a car shape on the card stock and cut out with scissor. Cut a circle of Funky Film for the headlight and apply. Cut the Red card stock to the desired size, here our card is 8.5”x5.5”. Cut a strip of black card stock and secure to the bottom right of the card. Place your card to the side so that it hangs off the side. Apply with Double Tack and trim the excess. Cut a piece of your map to go over the left side of the card, you can use decorative edge scissors to add detail. Apply your Shrink Film with Double Tack.